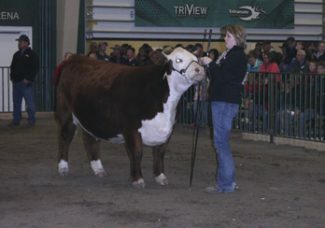 The Champion Horned Hereford heifer was consigned by White Cattle Co. of Buffalo, Wyo. She sold to Tom and Rhonda Kupke of Kearney, Neb. for $12,000. Watching a ring full of breed champions is a rare site in the cattle industry. However, at the Nebraska Cattlemen’s Classic, the best bulls and heifers competed against each other for the title of Supreme Bull and Heifer. A horned Hereford bull took the title of Supreme bull, and a Simmental heifer reined in the title of Supreme heifer. At the Classic, the Supreme breeders are given a $2,500 reward, and the buyers of the animals are given a $1,000 reward. The horned Hereford bull came from White Cattle Company in Buffalo, Wyo. The bull was born on 3/5/2011, and is a son of CRR About Time 743. He was sold to Buddy Leachman, Big Gully Farm, of Maidstone, Saskatchewan, Canada, for $15,000. Joel and Karri White run the ranch, where they have Herefords, Red Angus and club calves. The Whites are fourth generation cattle ranchers, and have two children who are also involved with the operation. “We felt very fortunate to have won Supreme Bull at the Cattlemen’s Classic as well as having the Champion and Reserve Horned Heifer in Kearney,” said Joel White. Their horned Hereford bull, Great Divide, took home the top honors as the Supreme bull at the NCC. A total of 11 breeds competed, including horned Hereford, polled Hereford, Red Angus, Black Angus, Simmental, Charolais, Limousin, Gelbvieh/Balancer, Shorthorn, Maine Anjou and Chiania. Great Divide is a special bull to the Whites, and proved he can compete with the best. “He was out of a first calf heifer, and he had a great feed conversion. He is sound, stout, has a low birth weight and could work in all phases of the industry” said White. The White family has been showing cattle for many years, and their daughter Lauren has been very active. “Lauren was active in 4-H and FFA, and we started our herd so that Lauren could become involved in the Junior Hereford Associations. Lauren exhibited heifers and steers at numerous state, regional and several Jr. Nationals,” said White. White Cattle company focuses on raising high quality animals through the use or artificial insemination and embryo transfer. 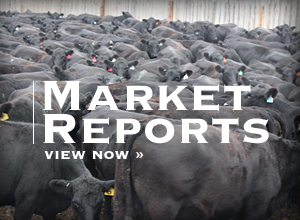 “Our goals are to continue to utilize embryo transfer and artificial insemination to continue to produce easy doing, stout, maternal, and industry improving type cattle,” said White. Maintaining a high quality herd has not been easy, as both Joel and Karri work full-time outside of the ranch. “The biggest challenge for us has been to build our herd and manage our resources and time efficiently. My wife and I both have full time jobs separate from the cattle, and our daughter is a full time student at the University of Wyoming and will graduate in May this year with a degree in Animal Science and a minor in Ag Business. She will be attending the University of Nebraska – Lincoln to pursue her Masters in Quantitative Genetics. Our son, Brian, is married and works in Utah,” he said. However, even though they have these challenges, they still love being in the cattle business. “The best part about having cattle has been watching our hard work pay off in so many ways. Not only is it rewarding to have great success in the show ring and sale ring with our cattle, but it enriches our lives by allowing us to spend time together as a family, provides us with many life lessons, and a wonderful way of life,” said White. The Supreme heifer came out of Hemingford Neb., with the Kraenow Cattle Company. The Simmental heifer dominated the show ring, and brought a premium price at the sale. ZKCC Cow 550X, a 01/10/2010 daughter of SVF/NJC Built Right N48, was sold to Felt/Willers/Forster Partnership of Wakefield/Stanton/Smithfield, Neb., for $21,000. The Kraenow family moved to the panhandle of Nebraska in 1985, and have been raising cattle ever since. Originally from Colorado, they moved to get away from a more hectic life. “Out here cattle are just part of everyday life and I am glad it is the life we chose,” said Zach Kraenow. Kraenow Cattle Company raises cattle to fit the needs of everyone, from the commercial producer to the seedstock producers. “My main goal at the ranch is to raise ‘Good Ones.’ To me, all the numbers, EPDs, carcass data, etc., is worthless if you can’t go out and ride through your cows and like them,” he said. The heifer he exhibited is definitely one that he considers to be a “good one.” In fact, showing her is the best memory he has of showing cattle. “My fondest memory showing would have been this year in Kearney when 550X was named Supreme Champion Female. When it was announced we won, I felt really good knowing that I raised that heifer and she was a product of our program, and that when you raise that ‘Good One’ everything will fall into place,” he said. The family aspect of the cattle business is also very important to him. “Another great part of this business is the family involvement. I couldn’t get all this done without a lot of help from my Mom and Dad, Deb and Gary, my girlfriend Paige, and my sister and her family, Kate, Jarrod, and Corbyn. The friends you make in this business are priceless. Just being involved with cattle I have made contacts all over the US, Canada, Australia and Mexico,” he said. Competing at the Classic was very rewarding for both breeders this year. 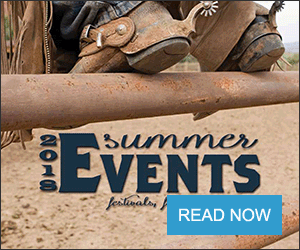 “The Nebraska Cattlemen’s Classic has been very good to us, and we enjoy going back every year,” said White.